Welcome to PARADISE ISLAND! LOCATION FULL ON WATERFRONT! VIEWS Right out Your Door! 1/1 GEM! 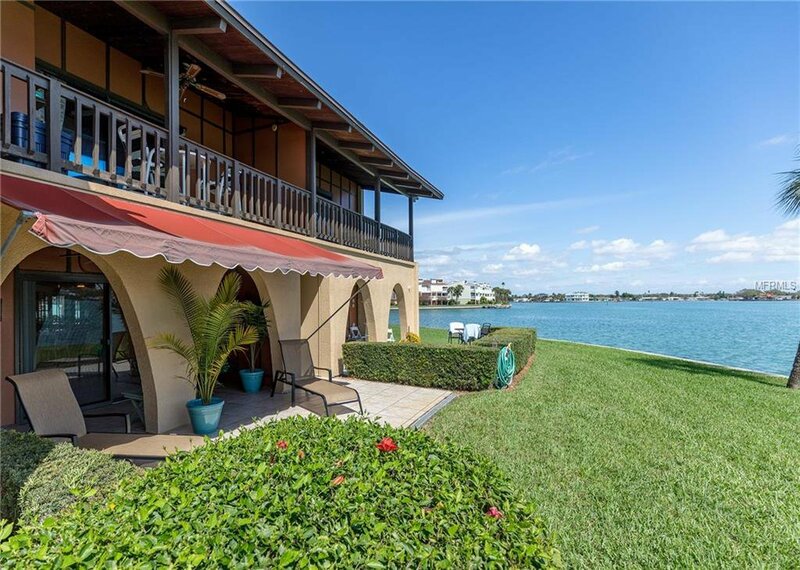 HUGE PATIO, Awesome Panoramic Waterviews! Boats cruising by all day...Check This Out! WATERVIEW!_ 1/1, with Updated Kitchen & Bath ,Jaccuzzi Tub and inside Laundry Washer and Dryer. The POOL IS on HEATED! This is Just Right for YOU! Ready for you to RELAX! This PATIO IS Right on the WATER!? Maintenance Free Living at it's Best. FISH FOR YOUR BREAKFAST! Park Your Boat and conveniently head out at a moments notice! Boats, Boats, Boats. Get this Condo Now! Before they ALL FIND OUT ABOUT THIS SPOT! Kayaks Are Stored Here! Bicycles are Popular Here! to ride Right Down to the Beach! You Have an Assigned parking space right beside your Front Door! Amenities include Water Paid FOR in Dues, Basic Cable, a Heated Pool, Boat slips when available for low monthly fee, Grilling Area, Laundry Facility. The Treasure Island Community Center complex with Par 3 golf course is right around the corner with tennis courts, basketball & playground. Gulf Blvd and the BEACH are 10 minutes! AWAY! Great restaurants are so close and Entertainment with Nightlife & shopping really Close. Also easy access to downtown St. Petersburg! The Stadium 20 minutes! with professional baseball, soccer. Downtown St Pete has museums & theatres. All of this just 30 minutes from Tampa International Airport.Don't Come Over her without your SUNGLASSES_This is Paradise. Listing courtesy of REALTY PARTNERS LLC. Selling Office: COLDWELL BANKER RESIDENTIAL.